This kimono would have been worn by a woman of the samurai class, the ruling military elite of Japan during the Edo period (1615-1868). The design has has been created using a paste-resist method called chaya-zome, which involves the extensive coverage of the fabric with rice paste, leaving only small areas of design to create the pattern when the cloth is dyed. This highly skilled and expensive technique, which results in an indigo blue design on a white ground, was reserved for the summer kimono of high ranking samurai women. Here the technique has been combined with a stencil-dyeing technique called kata kanoko and embroidery in silk and metallic threads. 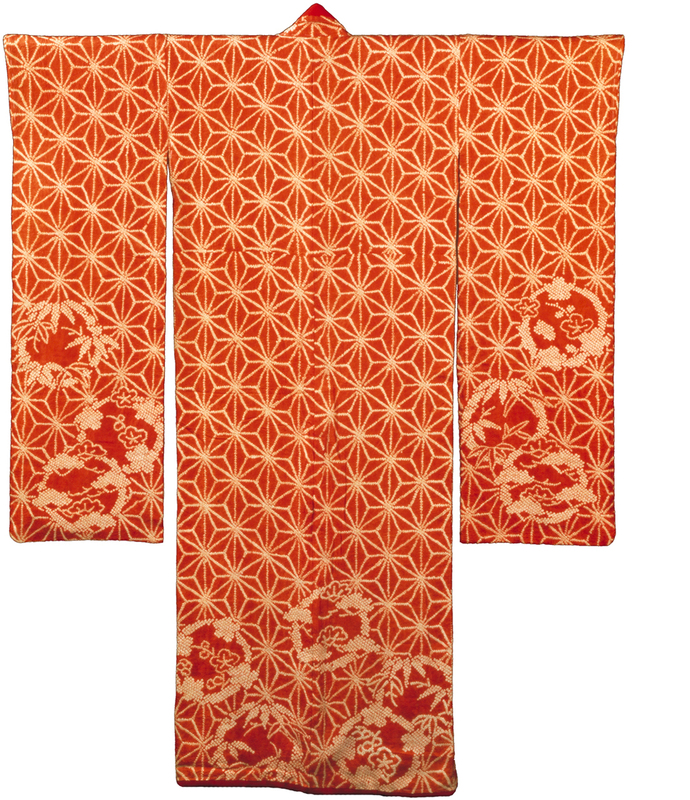 The padded hem on this kimono indicates that it is an outer kimono, or uchikake, designed for winter wear. Uchikake were worn without an obi, the sash that secures the garment, so no part of the design would have been obscured. The shibori, or tie-dyeing, technique has been used to create a pattern of paper gift ornaments in the shape of butterflies. This has been combined with embroidered plum blossoms. This auspicious motif was a popular one in winter, for it suggested that the arrival of spring was not too far away. 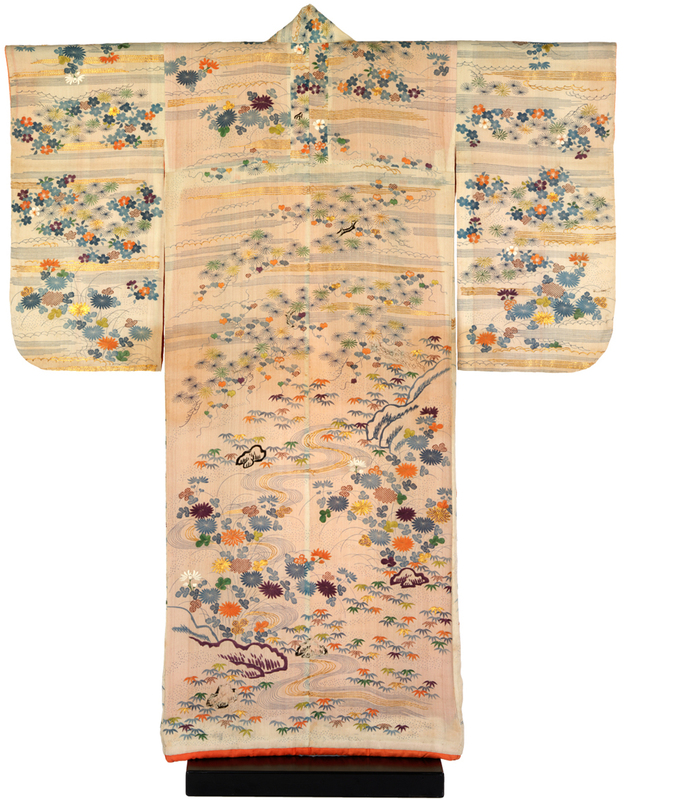 The long 'swinging sleeves' (furisode) of this kimono indicate that it would have been worn by a young woman. Red was a popular choice for young women’s kimono because the colour symbolised youth and glamour. The dye, known as beni, was produced from safflowers and was very expensive. The whole garment is decorated using a tie-dyeing technique known as shibori, which was also very costly. 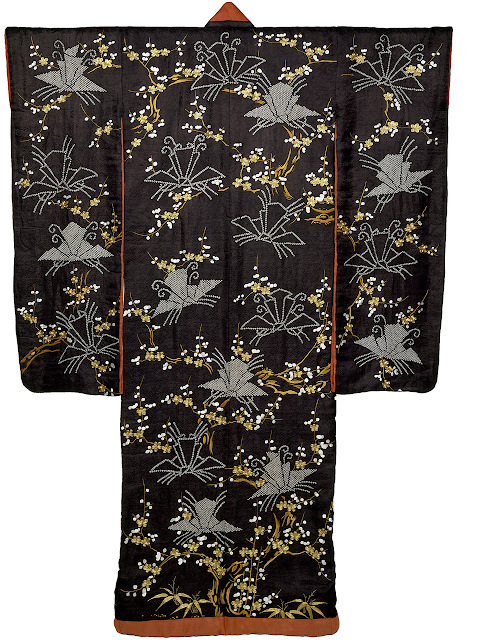 The woman who wore this kimono must have come from a very wealthy family. The auspicious design of pine, bamboo and plum on the hem and sleeve ends suggests she wore it for a special occasion. The garment has been shortened at the waist, indicating that it was designed, or later adapted, to be an under-kimono.